A message from party headquarters also says speculating about Budget measures benefits nobody (except the media). FINE GAEL TDS have been assured that no decisions have yet been taken on the measures to be introduced in this December’s Budget – and asked not to speculate about its contents. A message sent from party headquarters on Mount Street this afternoon, seen by TheJournal.ie, assures TDs that despite renewed media speculation about what might be contained in December’s Budget, the cabinet had not yet held any substantial discussions or made any such decisions. The TDs are told that possible Budget measures would be discussed later in the autumn, when they would be given an opportunity to offer their thoughts on proposals in a way that has not been done previously. The circular advises TDs that it might be dangerous to take any outspoken position on a measure which does not ultimately form part of the Budget, and therefore not to speculate on its comments. The only people who benefit in the meantime, the message suggests, are the media – who are then able to ‘manufacture’ stories about possible rifts between Fine Gael and its coalition partner Labour. The latest updates to the EU-IMF memorandum of understanding commit Ireland to €3.5 billion of Budget adjustments in this December’s Budget, including €2.25 billion of spending cuts and €1.25 billion of tax increases. Among the new taxes being imposed will be the value-based property tax – a replacement of the €100 property charge – and reforms of motor tax, as well as a “broadening of [the] personal tax income base”. This morning Enda Kenny refused to engage in further discussion about the possible measures being considered for the Budget, and this afternoon said the Budget would not be drafted in public. Poser: Does the government comment on its Budget plans? Poll: Should income tax be protected in the Budget? 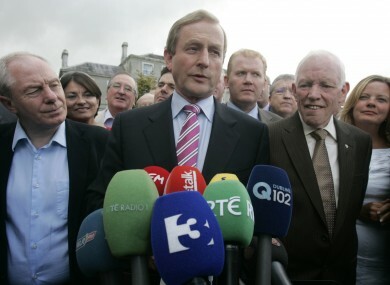 Email “Fine Gael HQ assures TDs: No decisions made about Budget 2013 yet”. Feedback on “Fine Gael HQ assures TDs: No decisions made about Budget 2013 yet”.